Stunning illuminated bathroom mirror bringing a touch of elegance to any bathroom. 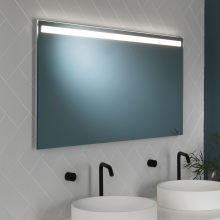 The rectangular mirror has frosted acrylic sides which incorporate two fluorescent lamps, providing a clear white light to brighten your bathroom and enhance the functioning of the mirror. The mirror has a hand wave on/off switch to facilitate a relaxing bathroom experience. It also has an integral heated demister pad. The mirror is IP44 rated, which makes it suitable for use in bathroom zones 2 and 3.